Hi! My name is Tyler Coughlan and want to tell you a bit about where I live and why I love it so much. Growing up on the bank of the Miramichi river is the best thing that can happen to a child. My younger brother Tyson and I get to go swimming, flyfishing, boating, tubing, canoeing or kayaking in the summer. In the winter you can snowmobile, play hockey, snowshoe, cross country ski or go sliding. Tyson and I love where we live and we are sure that you will love it too. Here's a photo of me and and Courtney Hatfield from Get Reel with Shelley and Courtney', along with a "Giv-er on the River' video segment that appeared on 'You Tube' - starring yours truly of course!. 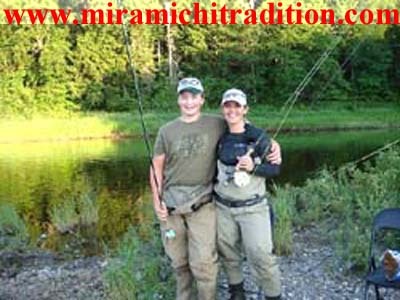 A Miramichi Tradition Flyfishing is a family tradition at the Coughlan household on the Miramichi River in New Brunswick, Canada. Tyler and Tyson love to fish from the time the season opens on April 15th until October 15th when it closes. The family owns and operates Miramichi Country Haven Lodge and Cottages and the boys enjoy the opportunity to meet people and their children from all over the world. The boys love to go fishing with their Dad and even though Tyler works for the Miramichi Salmon Association always finds time to help out and guide on the weekends. Tyler's pride and joy is his little cabin in the woods next to a bubbling brook ,it is nice walk from the main lodge and a serene place to watch some wildlife. It is used in the summer and also by people who stay at Country Haven in the winter. They snowshoe there and get warm by the wood stove once owned by Tyler's grandmother. Hi There! We tie many types of Salmon and Trout fishing flies, both 'dry' and 'wet'............... So drop by our Gift Shop at the Lodge and see what we can offer you, including flies, books, hats, shirts and odds & ends.